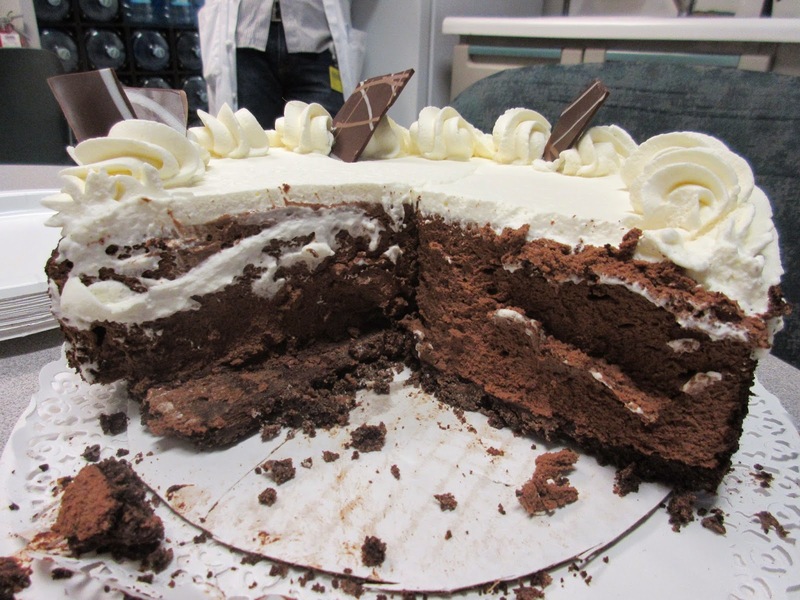 The title refers to two things...a penalty cake and the Chocolate Mousse Cake from Pastiche. In case you don't remember a penalty cake is assessed when someone insists they can't see or find something when in fact it is usually right there. Well, that's one example for a penalty cake. The "penalty" hits when they seek unnecessary assistance. Usually they are asked if they are sure things are as they say and if they insist and are shown to be wrong..PENALTY CAKE! 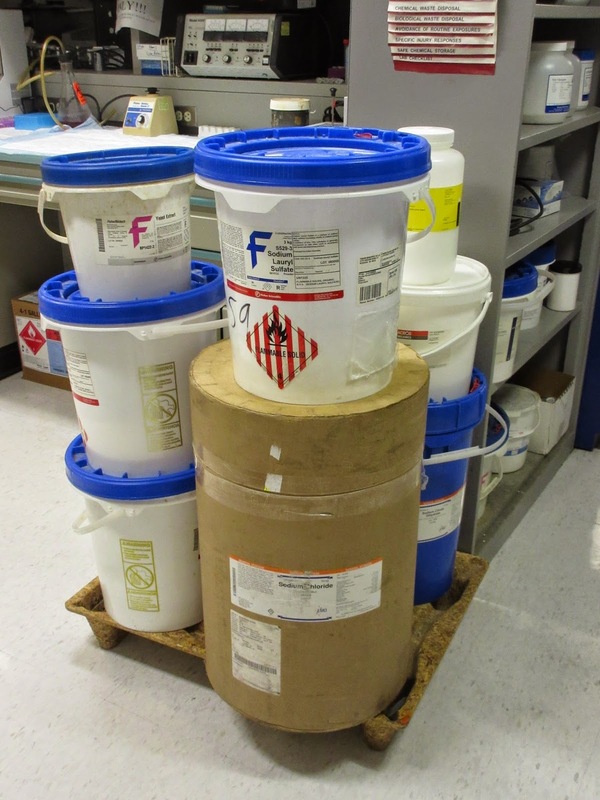 This time around one of our intrepid folks could not find the Sodium Chloride and insisted there was none. The person he asked to help, moi, knew there was a lot and inquired as to whether it was sure there was no NaCl. He was sure and even as I was kicking the tub full of the salt, asking "Are you sure..."., he maintained there was none. When I showed him what I was kicking he realized it was time to buy a cake. Can you find the Sodium Chloride? He set out on a stormy day, having checked online for positive reviews, to Pastiche, one of the better if not the best bakery in Providence. 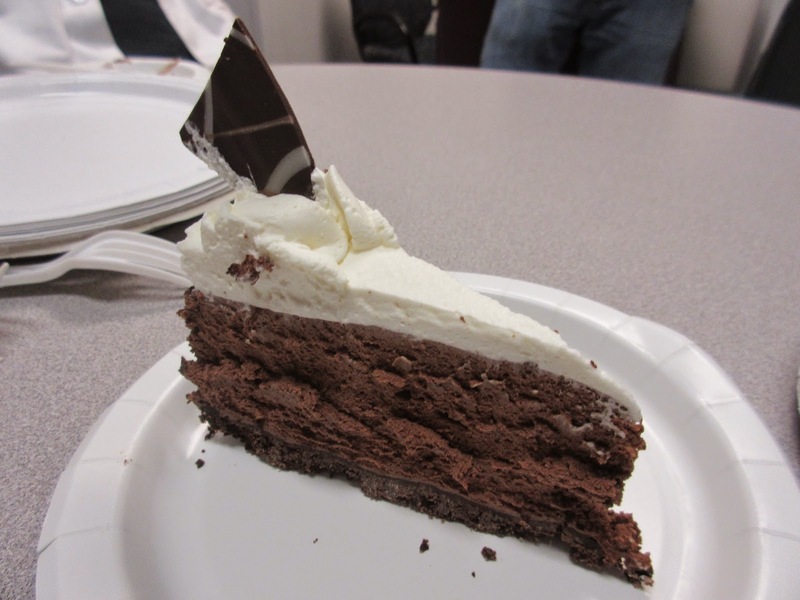 He came back with a Chocolate Mousse Cake which, like the assessed penalty, we have not had in a while. Cookie crumble on the outside! Topped with real whipped cream and some chocolate garnish! If you are a chocolate mousse lover this is the cake for you. 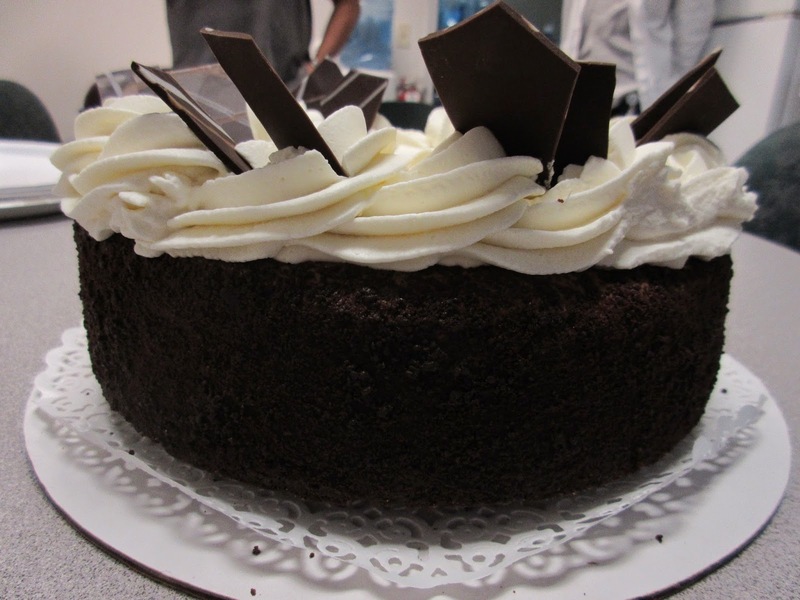 There is a cookie base, with about 2 inches of mousse on top which is then frosted with fresh whipped cream and garnished with chocolate pieces. It is lighter than it looks and it all goes very well together. The whipped cream offsets the density and sweetness of the mousse and the cookie bottom gives it some texture. It really is very good and highly recommended even in the absence of a penalty! Thick layer or mousse is featured! How about a nut corner! Have you ever heard of nut corners? Actually they go by the German Nussecken which means.... nut corners. Nussecken sounds better don't you think? 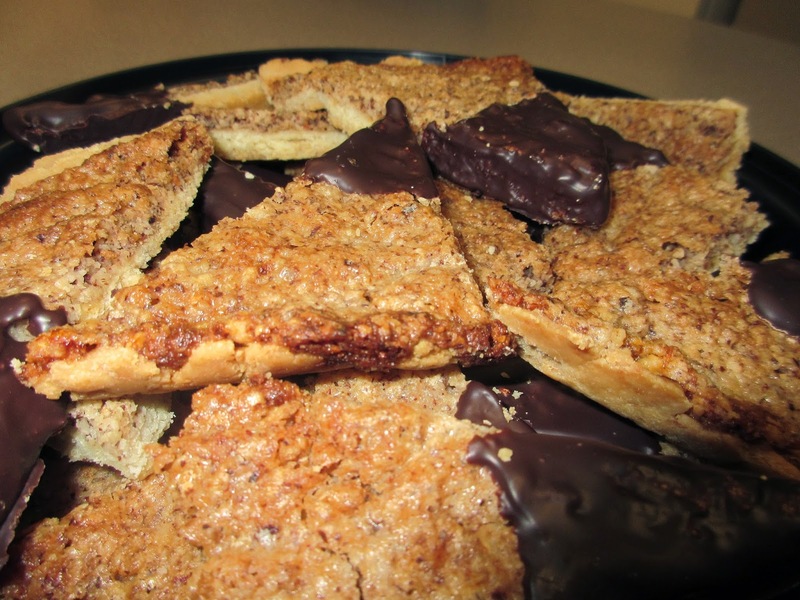 These are a type of cookie that consists of a dough base and a topping made with ground and sliced nuts. 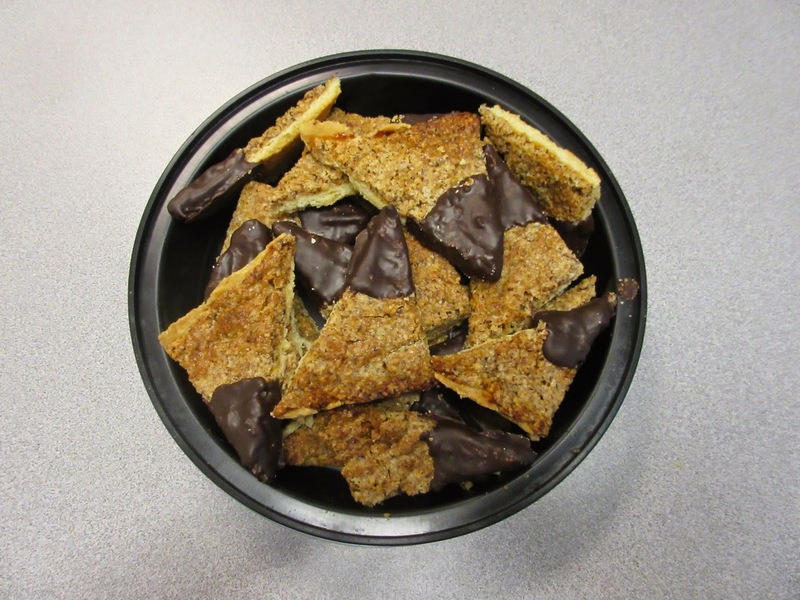 They are formed in the shape of triangles - corners - usually one or both of the ends will be dipped in chocolate. The "Baking Exchange" liked these a lot and felt they were very "European." To quote their description: If you like nuts and shortbread type cookies, these are the next cookies you have to make. They are buttery delicious and very “European”. The use of ground nuts is what in my opinion, makes them “European”. We don’t use ground nuts very often, and it’s hard to find them in grocery stores in the U.S. They can however, be made easily by grinding the nuts in a food processor. So all you have to do make something European is grind some nuts and toss them into your recipe! Good to know! It is not surprising that we had such a treat today as our baker was indeed European. Well actually European-American. (Is there such a thing?) 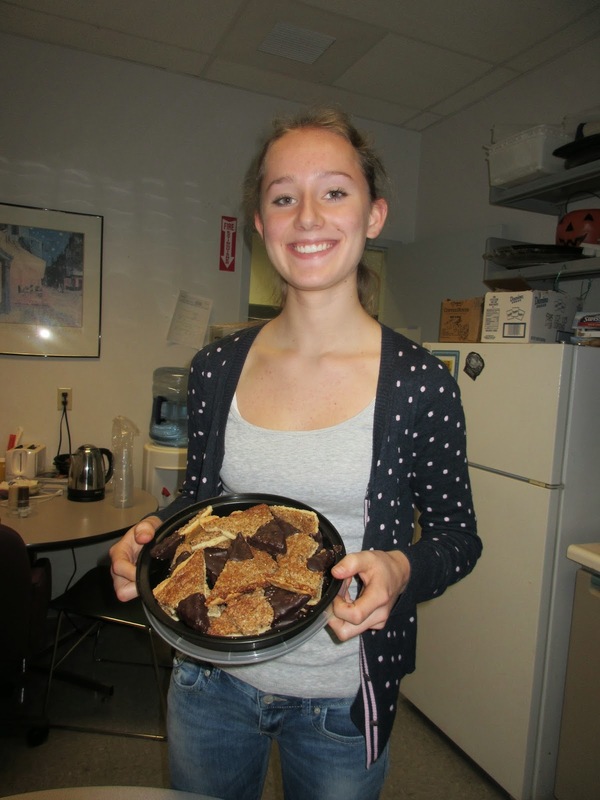 Although her parents were German, she was born in the US during Dad's fellowship so now she has the best of both worlds and may or not routinely use ground nuts in her baking. She is also our second generation cake hour attendee as her Dad attended cake hour back in the early days of the 1990s. These are indeed very good. When you get something that is made with all these great ingredients like butter, almonds or hazlenuts and chocolate how could you go wrong? Well, if you have a recipe in the metric system and only measuring vessels in the English system it does become a challenge. I guess this will make them the American-European version. Might be on the flat side! Our friend was undeterred however and managed to come up with enough that passed muster that she could bring. The finished product was quite delicious. They may have quite what they should be and probably little flatter than usual but nobody seemed to mind. They went very quickly and we will look forward to the next unchallenged batch! These may be challenged but that didn't stop us! 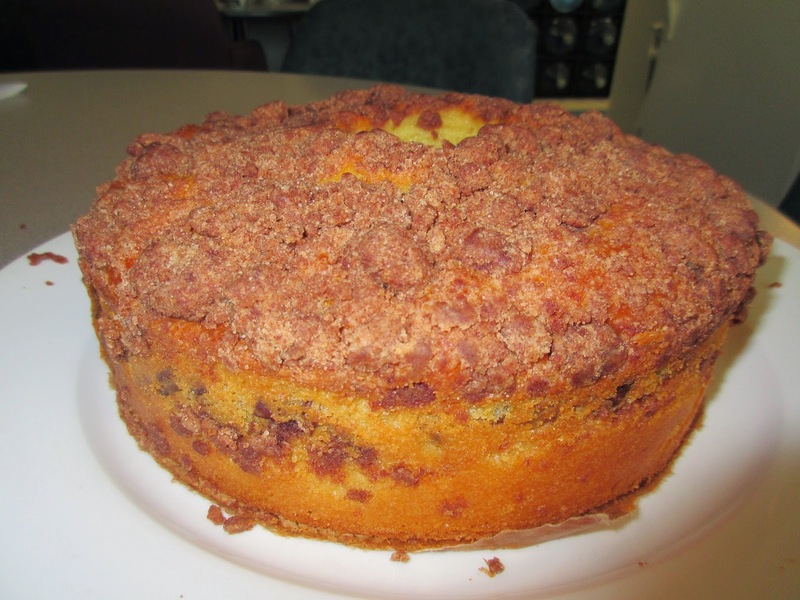 Every now and then....you gotta have a coffee cake! Cake hour is also coffee time. We have a coffee service but we bring out the deluxe kind for cake hour. Okay, it's Starbucks but still darker and more flavorful than the other stuff we have during the day which actually is not that bad. Okay so we treat ourselves and like everyone else thinks Starbucks is a little special. What's the big deal? 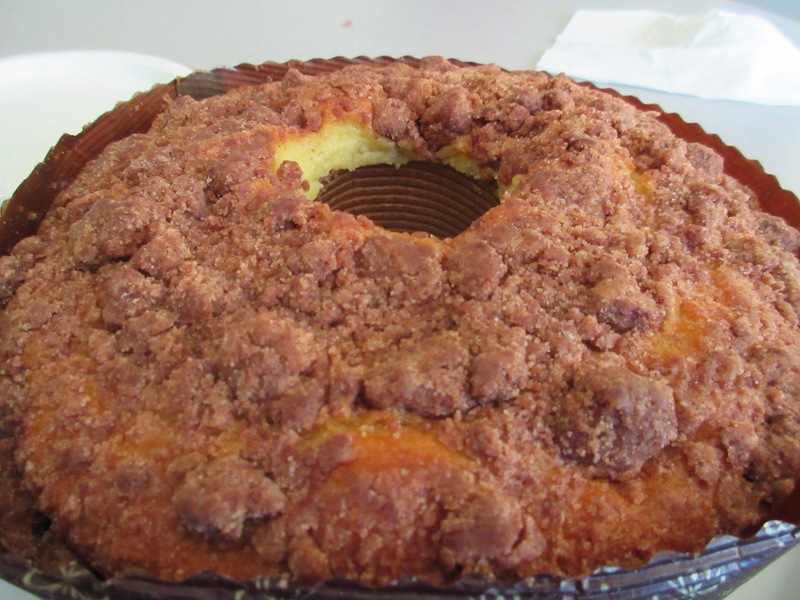 Since it a coffee time every now and then you have to have a simple coffee cake. Today's treat from the East Side. Guess what type it is!! 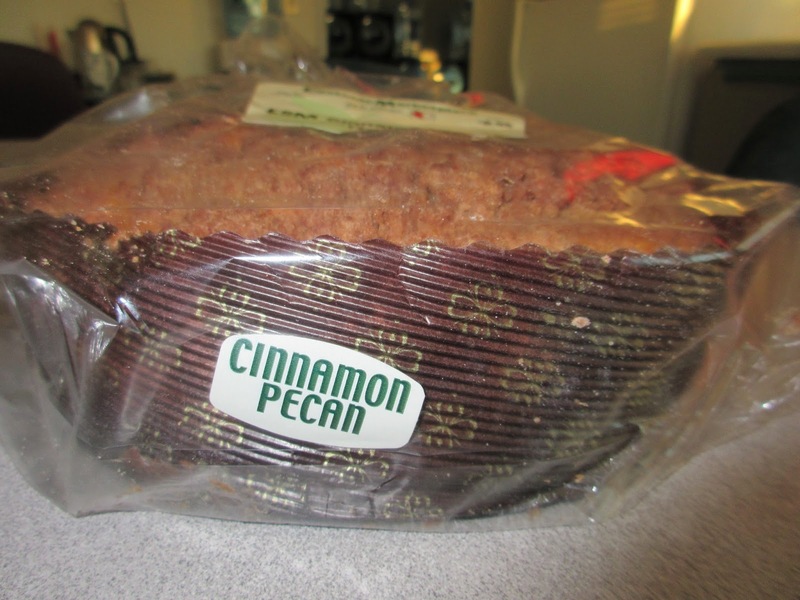 This is a great cake after all...yellow fake with cinnamon and usually nuts - walnuts or pecans being the most common. It is intended to go with coffee or tea and never fails. This one came from the Eastside Marketplace in Providence and they do a very nice job with this cake. 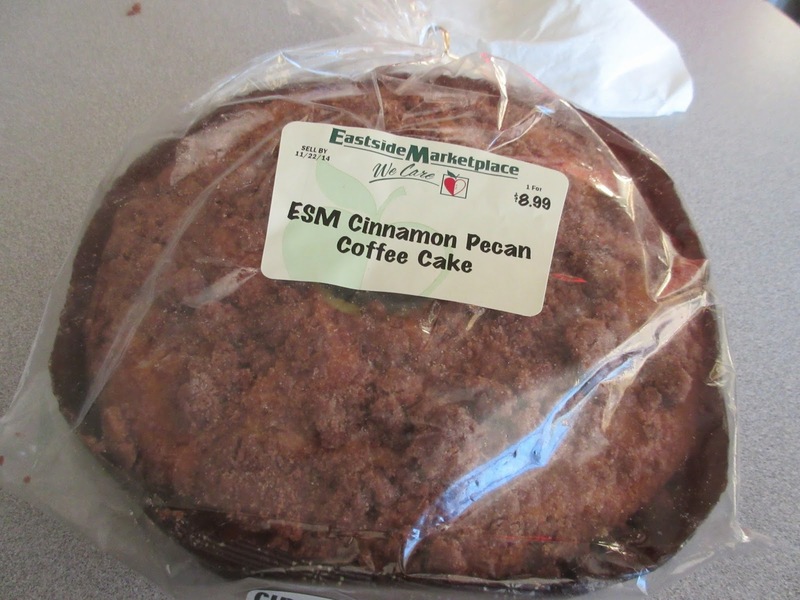 This was their cinnamon pecan version and it didn't last long. 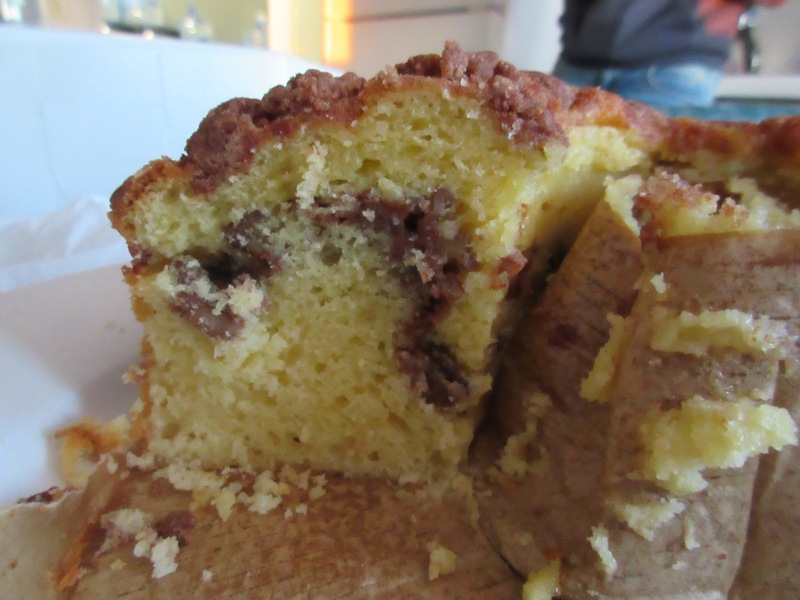 Very moist cake with a ribbon of nuts through the batter. Add in lots of cinnamon sugar on the top and you got a classic coffee treat that has to be tried on occasion for a special treat..just like the Starbucks coffee! Soon to be As American as Pumpkin Pie..
One of our colleagues has decided to move on from his Hungarian heritage and become a full fledged American boy. Should you not know the process at one point there is a citizenship test. For this test you go to an appointment and they give you a quiz about American history. If you pass the quiz then all you have left is a swearing in ceremony and then you can enjoy the fruits of American citizenship meaning you may actually accrue some benefit for paying all the taxes you had already been paying as a J-1 visa or green card holder but were ineligible for most federal programs. You also get to vote or not vote if you are like most Americans. 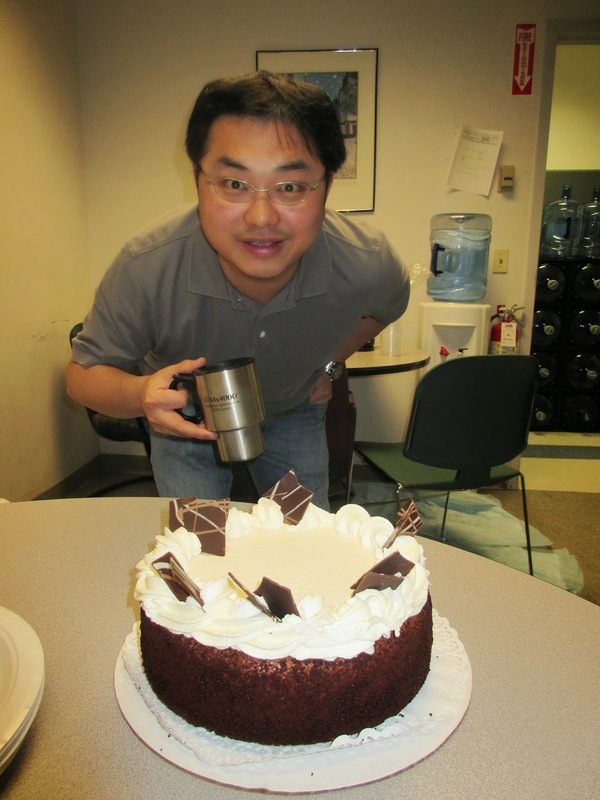 Our buddy passed with flying colors, or so we think and since he was in the area of Johnston, RI he searched using his phone for a bakery and picked up something to celebrate this milestone at cake hour. 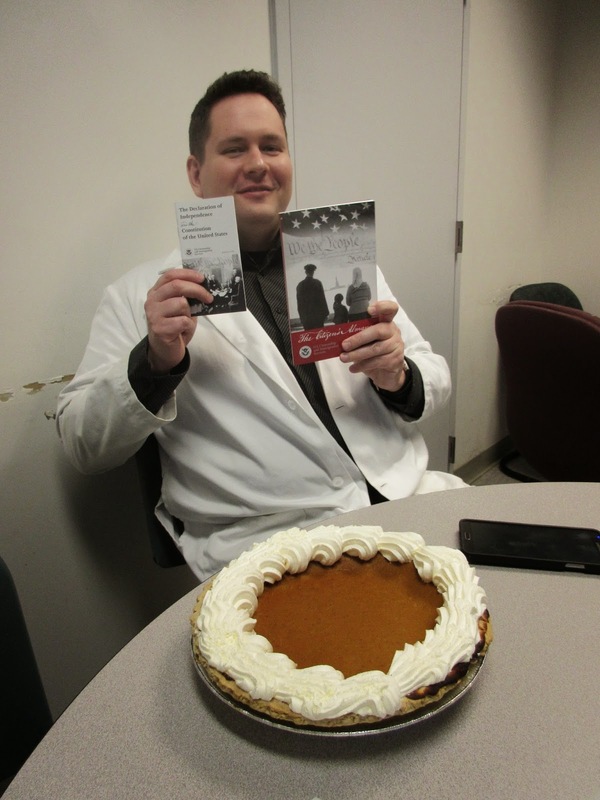 He opted for something solidly American and appropriate for this time of year...a pumpkin pie! Nothing like an all American pie! 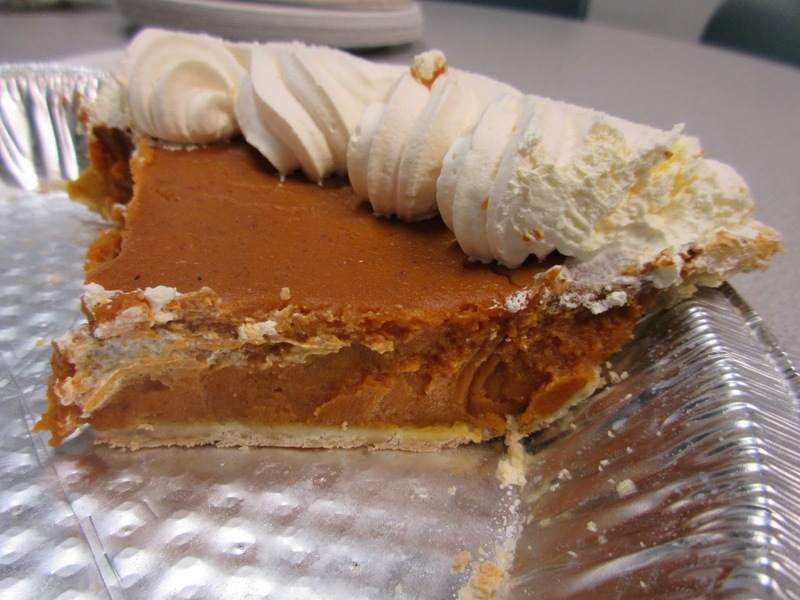 This was good and was pretty much your standard pumpkin pie. 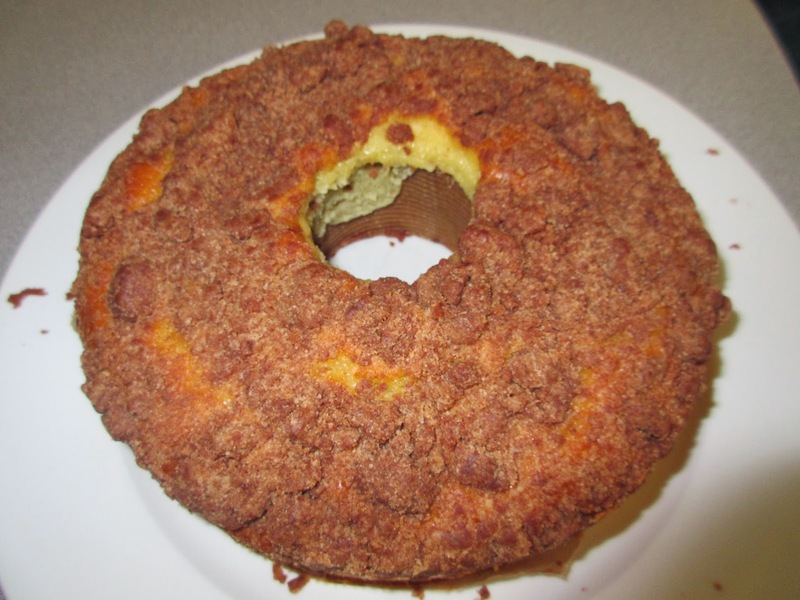 It had just the right amount of spice, had a great texture and some whipped cream florets to top it off. 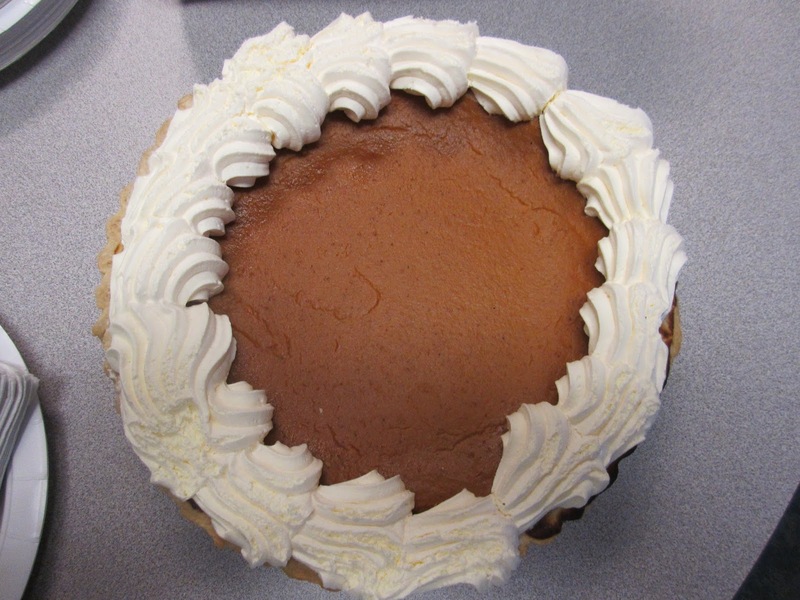 Whipped cream or vanilla ice cream is always a good complement to a pumpkin pie. it was a nice choice and appropriate to celebrate his pending confirmation of American citzenship. 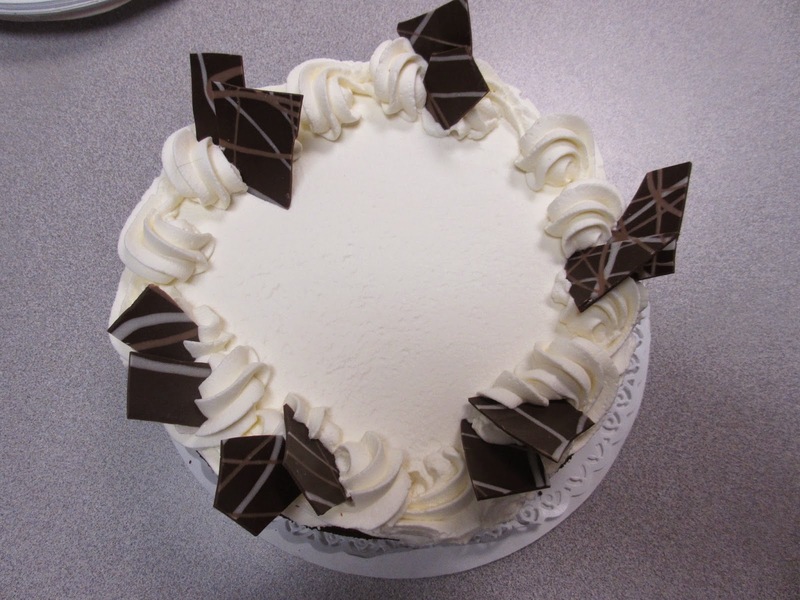 Nice whipped cream flourish on top! Just like they serve in luxury hotels! 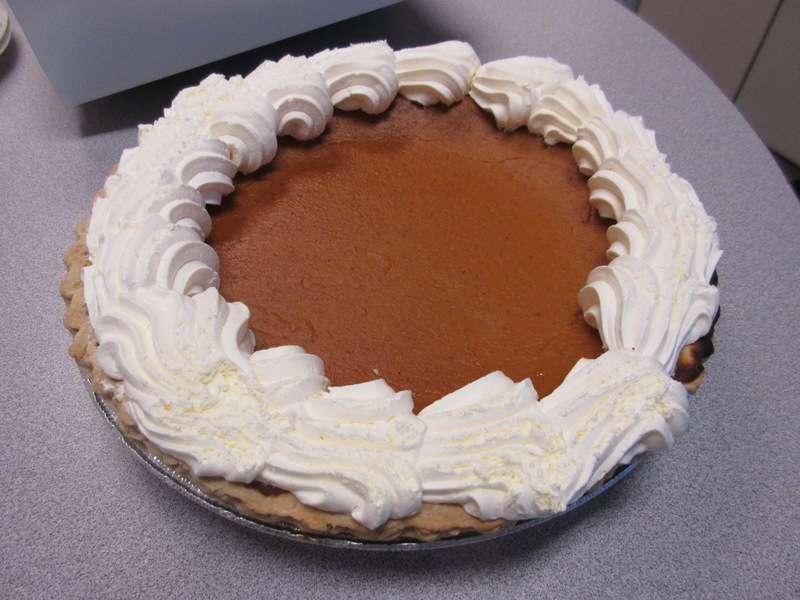 Pumpkin pie is ubiquitous recipe this time of year and lest you think everyone has their own I will tell you about the exchange I had with the pasty chef of a five star luxury hotel. He featured all these mini-pumkpin pie tartlets that were very good. 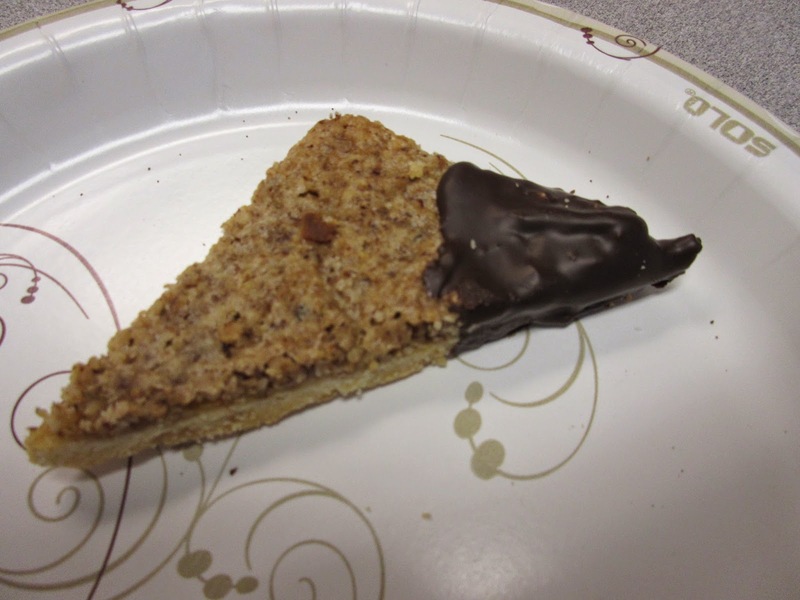 It was a bite-sized version and because the relative amount of filling was less in regards to the whipped cream on top and crust on the bottom, there was a better balance of flavor. I asked about these and if I could get the recipe. His response was that he always used whatever was on the can. So much for that. If you decided to make a pie using said recipe from the can you can always brag that it is the same that is served in the finest hotels! 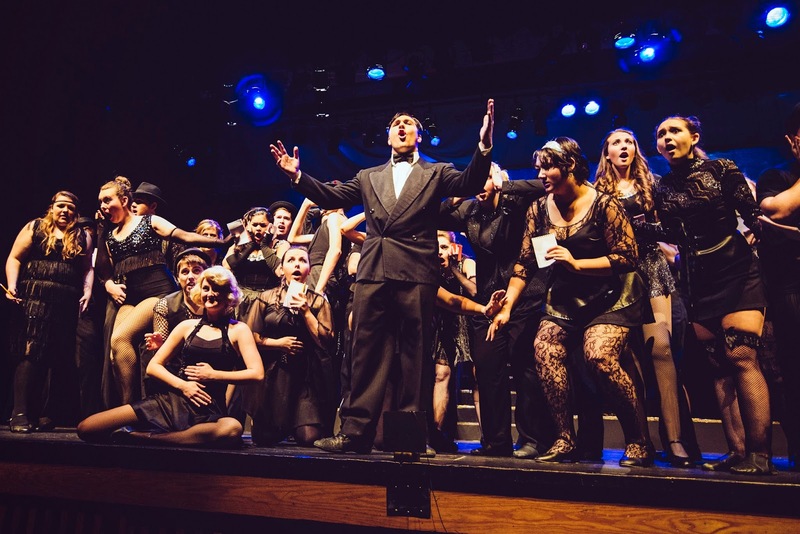 It's that time of year again..when one of us completes a musical theater project at a Boston area high school. 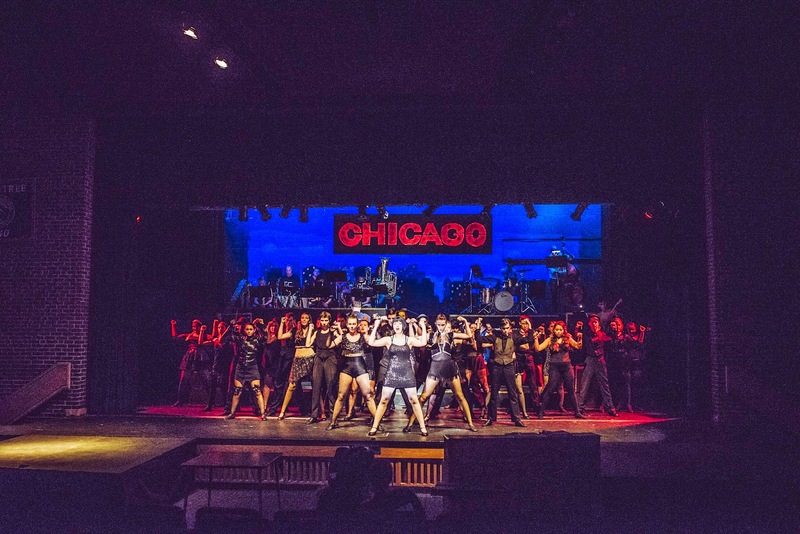 This year's production is the Kander and Ebb hit musical "Chicago"! 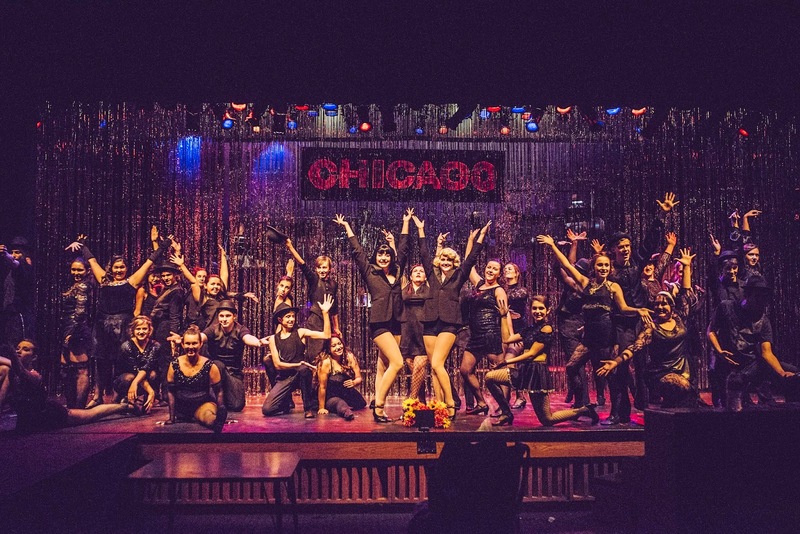 Other members of the Center show their support for this endeavor by donating or buying tickets and attending one of the performances. 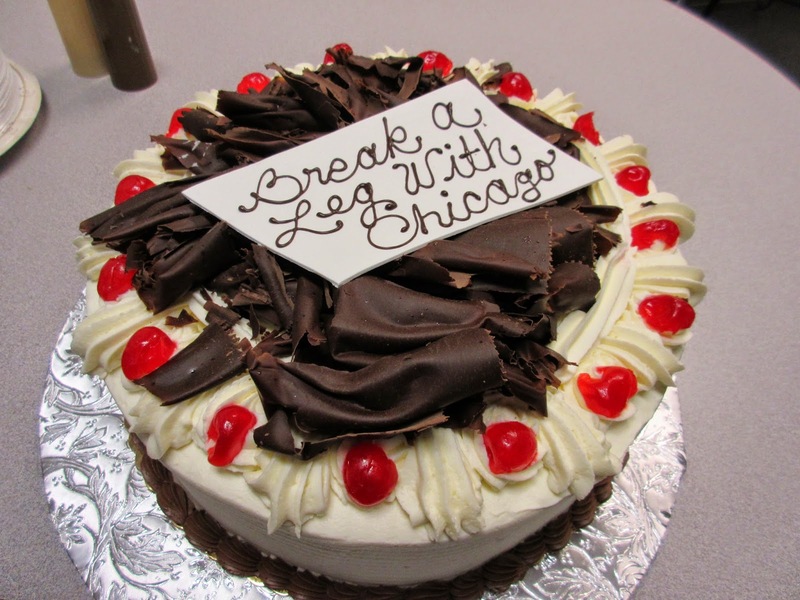 In thanks for this, every year we have a special cake for on the day of opening night with music from the show playing and maybe some pictures or other info. 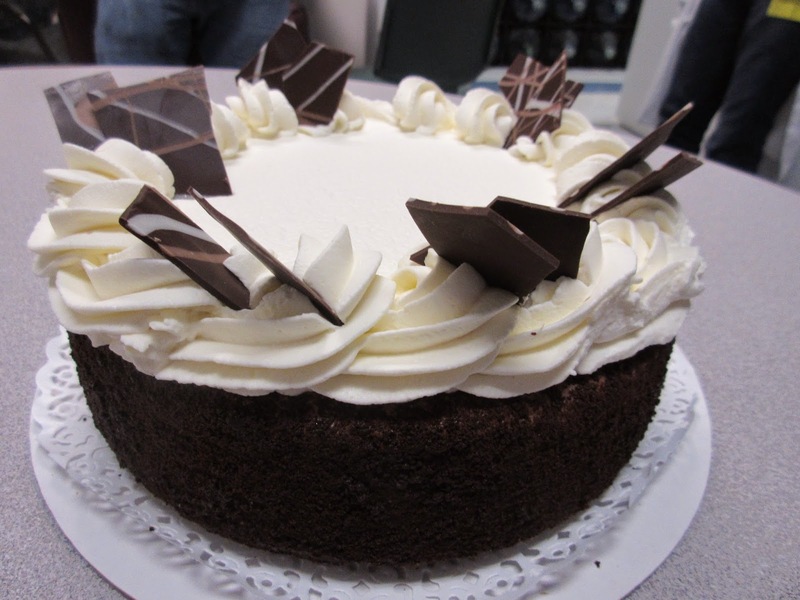 Actually the special cake every year is none other than our favorite Black Forest Cake or Schwarzwälder Kirschtorte. If you have followed this blog at all you know we have done a number of these from various places. This year we went to a new place in the same town as the high school. The bakery is called Konditor Meister and it is quite a bakery operation in Braintree, MA, that we hadn't tried before. It was nice when we ordered that the person taking the order knew exactly what we were talking about. They even knew that the recipe called for Kirschwasser or cherry brandy. They took the order in the afternoon on Wednesday and had it ready on Thursday morning. It was a very impressive cake. Quite large, actually, even though a standard 10 in was ordered and decorated perfectly. 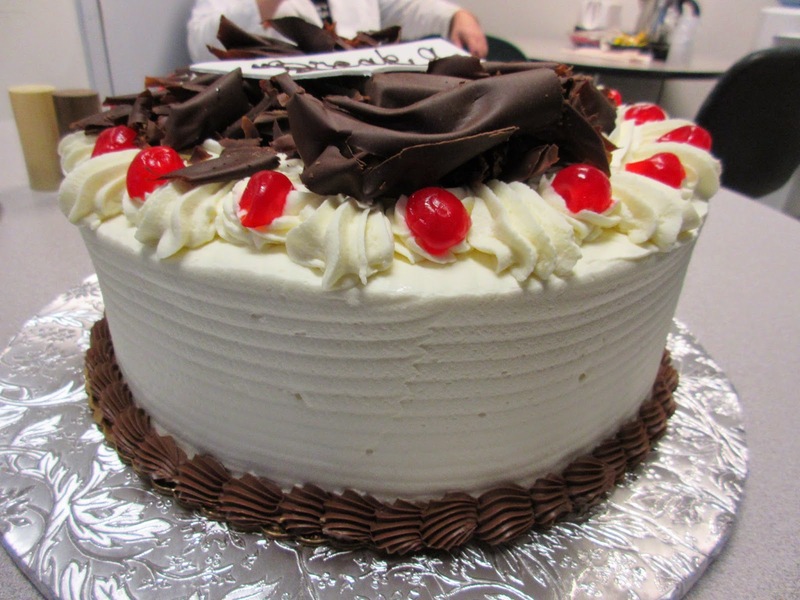 In short it looked exactly like a Black Forest cake should although your won't find maraschino cherries on one in Germany. 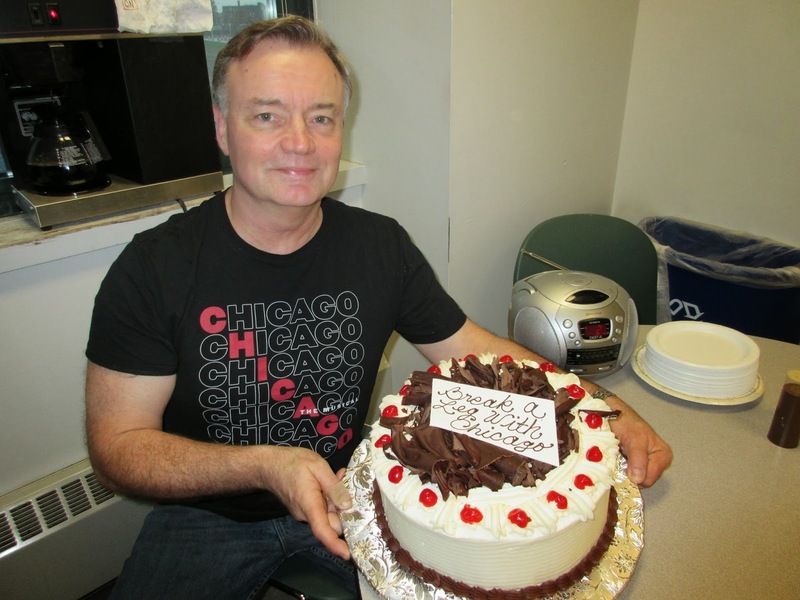 The director with Chicago wear and the Opening Night Cake! 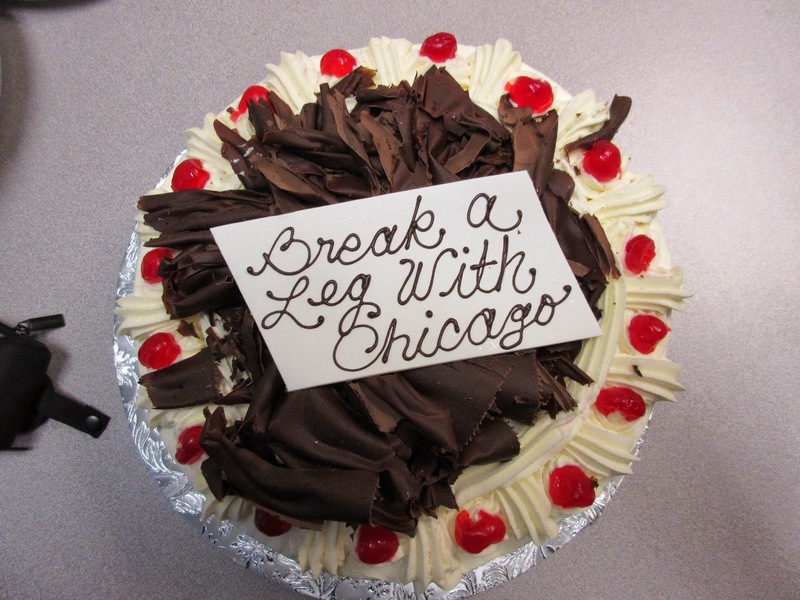 Message for the Cast and Crew! Impressive cake and pretty big too! Of course, the crucial test is the taste! This one more than lived up to expectations. The chocolate cake was moist and not too sweet, was filled with sour cherries as it should be, and it was frosted with whipped cream which is a must. (Really - if anyone ever tries to pass of a cake with butter cream frosting as a Black Forest cake, don't buy it!) This cake had all the requisite layers upon slicing and tasted great. It was very fresh, lighter than you would think and had the necessary hint of the kirschwasser cutting the sweetness. This was probably one of the most authentic and delicious ones we have had. I guess, what would you expect from a place named Konditor Meister. 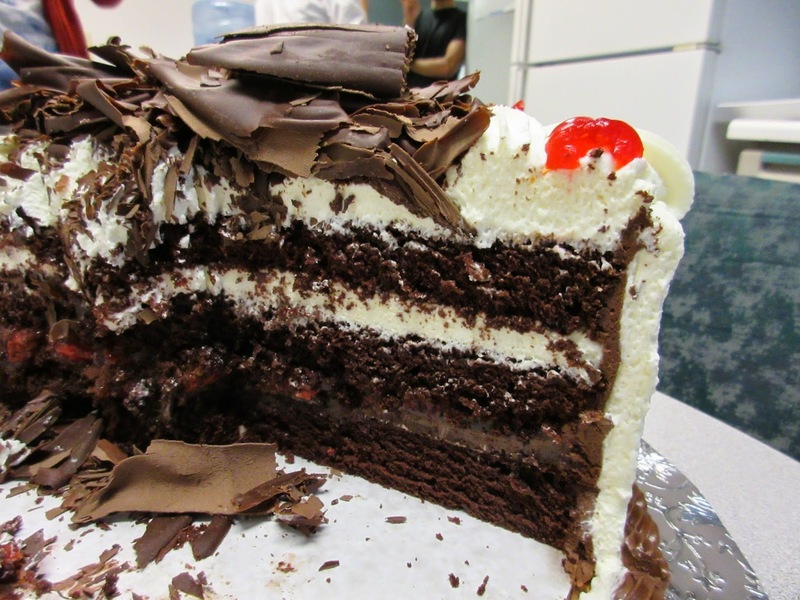 This cake is highly recommended should you want a true Black Forest experience. Well decorated with the Whipped Cream frosting the key! Everything just like it should be! 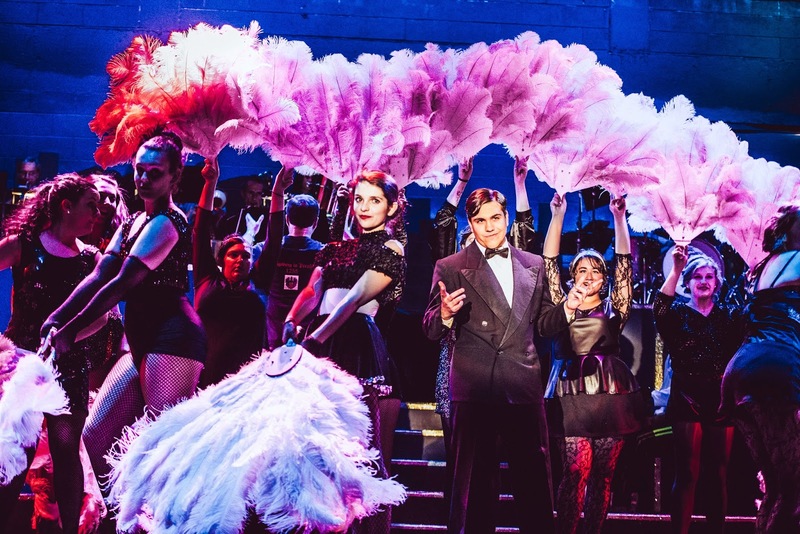 The show ran from November 6 through November 9th and was an enormous success. This was notwithstanding the accommodations that had to be made to make it high school material. Audiences loved it and the kids came through with flying colors. 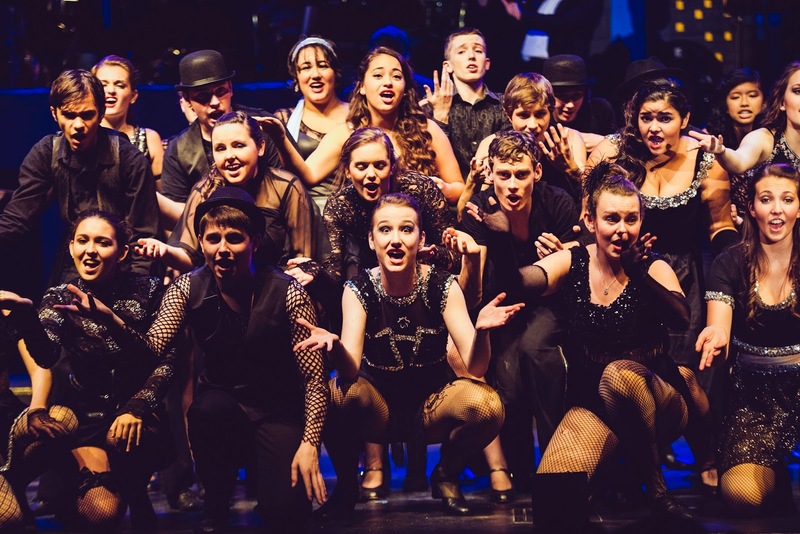 A few photos are attached to give you the feel for the show. Going to have a baby?